We are providing a wide range of Fancy Marble Lamps. 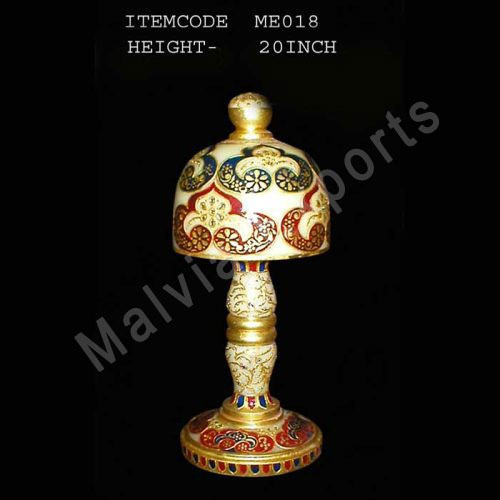 Established in the year 2001, we, 'Malvia Exports' are a prominent manufacturing, exporting, supplying and wholesaling a captivating range of Rajasthani Jewelry, Thewa Jewelry, Marble Handicrafts, Marble Ashtrays, Designer Marble Boxes, Marble Candle Holders, Designed Marble Clock, Coasters, Garden Fountains, Marble Goblets, China Bowl Lamps, Marble Paintings etc. These products are carefully created using optimum quality raw material like marble, gold and others, which are sourced from trusted and leading vendors. Supported by a team of adroit designers and artisans, we have been able to deliver an exclusive range of products that bring together an unmatched richness and artistic excellence. Empowered with a sound and sophisticated infrastructure that is well equipped with hi-tech designing machines, equipment and tools, we are capable of delivering even the bulk quantity within stipulated time frame. In addition, expertise of our designing professionals facilitate us in customizing the range of jewelry and handicrafts as per the preferences of clients. We entertain enquiries from International Markets.